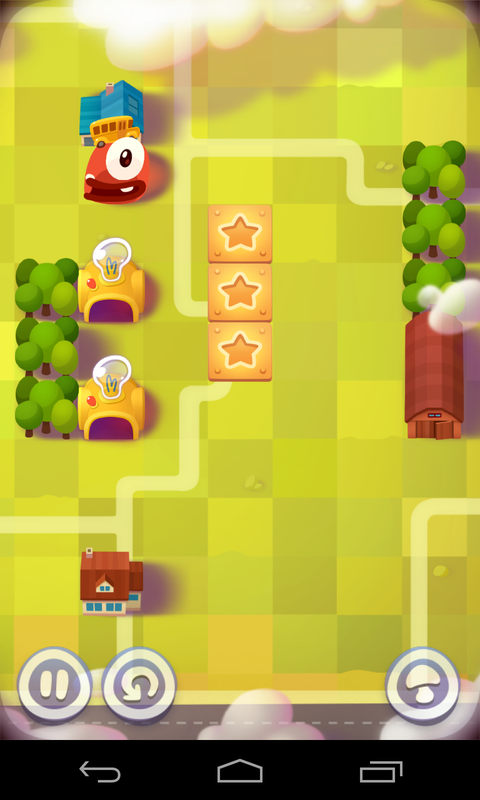 ZeptoLab has become one of the most recognizable names in mobile app development, thanks to the ubiquitous Cut the Rope, which has become a gaming staple alongside the Angry Birds franchise, Words with Friends, and Draw Something. Now they’re back with another blockbluster, the oxymoronic Pudding Monsters HD (because, after all, what kind of pudding isn’t cute and non-monstrous?). Whereas Cut the Rope focused on slicing cords, ropes, and strings to get a piece of candy into a reptile’s mouth, Pudding Monsters HD is about googly-eyed pieces of red, blue, purple and green pudding who are trying to unite with each other and gobble up stars. Three normal red puddings and a slimy green pudding. 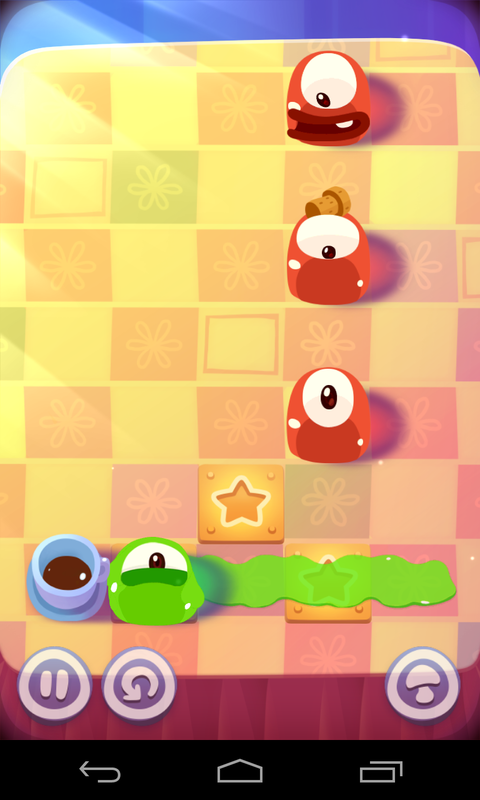 Pudding Monsters HD has simple controls – simply slide the puddings around to try and and smash them into each other. A level is considered complete when all the puddings are united into one giant, monstrous pudding. The star squares indicated in the shot above are likely familiar to anyone who has played Cut the Rope – your performance in each level is measured by how many stars you attain. An interesting wrinkle to Pudding Monsters HD’s gameplay, however, is how it only considers you have to “mastered” a level when you have completed it by getting 0, 1, 2, and 3 stars in separate playthrus. For me, this meant playing it thru again and getting 0 or 1 stars on many levels, since I had tried hard to get at least two stars on each level the first time thru. 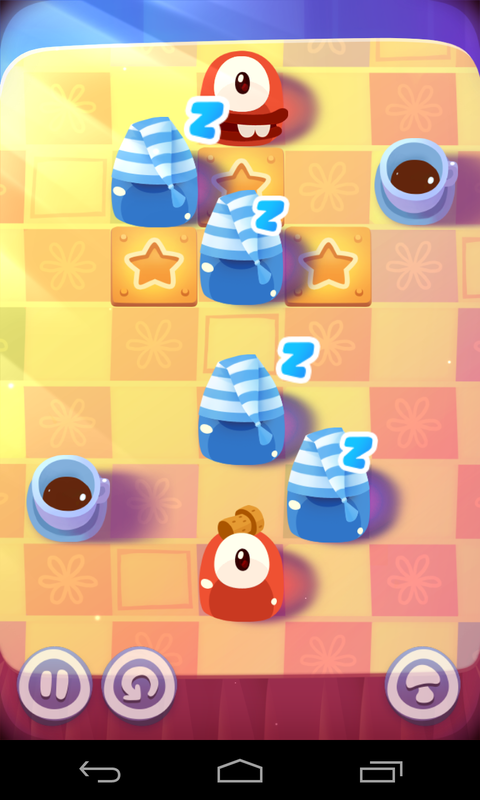 In the style of Angry Birds (but perhaps with better variety and flexibility in terms of the gameplay options it opens up), Pudding Monsters HD gradually grants you access to new puddings with new powers, and to machines/props that can be manipulated in each level. Red pudding – this is the standard pudding. It has no powers. Green pudding – these puddings leave behind a slimy trail when slid. Other puddings can be slid onto the trail and have their momentum halted by the slime, meaning that they’ll stick in the location. Purple puddings – these come in groups. Moving any one of them in a given direction moves all the others in the same direction. Blue puddings – these puddings are asleep and have to be “woken up” by having puddings of other colors smashed into them. A red pudding near some cloning machines. In addition to the houses, TVs, and coffee cups which create natural barriers to the puddings’ progress, there are also springs which bounce a pudding’s progress back, ice blocks which block progress one time only, and cloning machines which replicate any pudding which passes thru them. 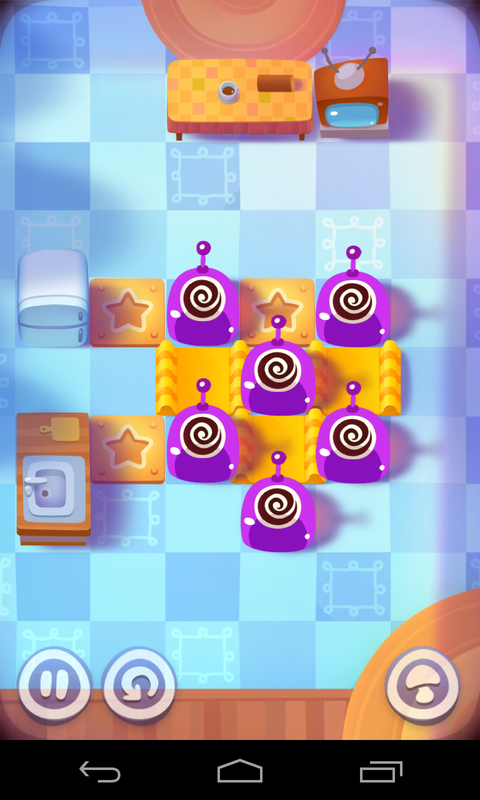 The springs and blocks are particularly useful – you must restart any level in which any of your puddings slides off the table, since that sliding makes the creation of the merged pudding monster impossible. As fun as Pudding Monsters HD is, it’s also perhaps too short and easy. This is perhaps excusable since it’s a new game. ZeptoLab has also promised new levels soon. I’m hoping that they can inflect Pudding Monsters HD with some of the difficulty found in the later stages of Cut the Rope, when trying to even complete a level becomes maddening (but in a good/can’t-wait-to-try-it-again later way). The game is $0.99 USD. 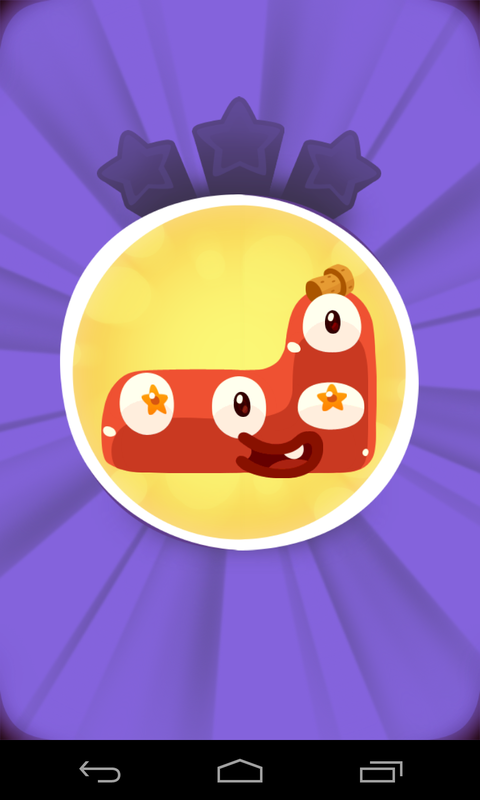 Like Cut the Rope, it offers the option of paid upgrades in the form of purchasable “mushrooms” or items that let you create a gigantic pudding monster with no effort, allowing you to capture all the star blocks on the board. While it can be completed in just an hour or two, this seems like a game with a solid future and plenty of room for expansion and diversification. Victory! A merged pudding monster.